One issue we all face is knowing when to press into initiatives without getting ahead of God. It is wounding to invest our energy and faith to contend for something that never happens… or find out later that it was never supposed to happen. In our hearts, we retreat back to a vow that says, “Lord, unless you tell me, I won’t commit the sin of presumption again.” Now that sounds spiritual and it fits a theological tradition that God is sovereign. However, God’s sovereignty really means that He can control whatever he wants to, but He usually makes room for His Kingdom kids to exercise initiative and power to work with Him. God is the only one with the keys to the car… but in the Kingdom, He’s letting His sons and daughters learn to drive. I admit it is possible to presume the will of God and make a mistake (we’ve all done it and suffered for it). The corollary is that, as we mature, it becomes easier to hear God’s voice and share the desires of His heart. It’s also true that when God invites us to do something (opens a door), it is beyond our own strength. It’s takes His power working through us. That too, is a bit scary. Too scary for the wounded. My life is always a balance of being content in my present state, putting His Kingdom first, and contending for His calling on my life. However, that’s an intellectual truth. The experiential reality our hearts long for is knowing when to step out of the boat and walk on the water. Most believers will tell me, “I will step out of the boat when Jesus invites me.” Now that sounds very spiritual and there are many times when the Holy Spirit does prompt us… and when we respond, fruit is born. It’s exciting. It’s where we all begin. There is another level of walking with the Father. We can have a conversation with Him and agree on an open door. But the reality of the Kingdom is that there are many open doors, and the Father is waiting for us to take the initiative to choose one and decide to walk through. The degree of difficulty still requires His power working in us. But it feels like the parable of the talents. He gives us something to invest, leaves, and comes back later to see how much we multiplied (Mt 25:14-30). It’s easy to walk with, and in the presence of the Holy Spirit. It’s also easy to build our theology around that closeness. But the reality of Kingdom is, “What we do when we don’t hear His voice or feel His presence?” Many believers do nothing but wait in that season. Entrepreneurs and people of faith take their talents, the mutual direction of their heart and God’s heart, and keep right on going. They are no longer toddlers requiring constant oversight; they are co-laborers who can be trusted with a vision. They aren’t waiting for the details of what to do. They understand the “why” in their Father’s heart and they give themselves permission to speak to closed doors, blind eyes, warfare and work. Moving from servants who “obey” to Kings who get “the why” is the key to the Kingdom. We know the “master’s business” (the why) and we are “friends” with an “appointment” to “go and bear fruit” and to ask “whatever” is needed to accomplish our and our Father’s “why.” That level of initiative or responsibility is also the key that ends the season of silence and restarts the conversation with Father. Appointed in the Greek is tithemi (5087). It’s used 100 times in the new testament to convey the idea of being set in your place… your calling or book. We use The Heart Plan to help people find that appointment. That’s were our “why” is. Q – When are we able to “press”? 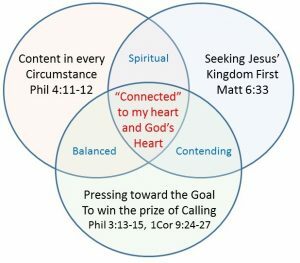 Living with passion and enthusiasm for our Kingdom assignment is very natural when our heart has a direction. We are excited about Jesus, worship, intercession, devotion and revelation. Time with Jesus always leads to working with Him, going with Him, and being sent by Him. We are saved by grace not works, yet we were created for works by God (Eph 2:8-10) and our faith is always best evidenced by those same works that are part of our calling (James 2:18). Enthusiasm literally happens when we are in Christ and working in our calling to express our “why” (en theo). Grace and works go together much more than they compete.